Oral or written recommendation by a satisfied customer to the prospective customers of a good or service. Considered to be the most effective form of promotion, it is also called word of mouth advertising which is incorrect because, by definition, advertising is a paid and non-personal communication. Turning your customers into your most effective sales and marketing asset by doing something they don’t expect, thus giving them a story to tell. But as a practical matter, that’s not quite nuanced enough either. 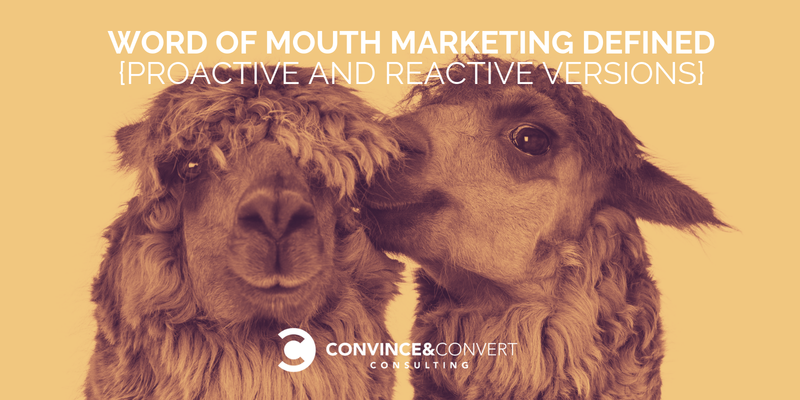 Because even when you succeed in getting your customers to talk about your business, there are still two different types of word of mouth: reactive word of mouth, and proactive word of mouth. To achieve either, you need to first understand that competency doesn’t create conversation. When you do exactly what your customers expect and anticipate you will do, they do not mention that to anyone because there is no STORY there. I have never said — to anyone — “Hey, let me tell you about this perfectly adequate experience I had recently.” That would be a terrible story. Not interesting to tell, and not interesting to hear. Word of mouth requires story crafting. If we can help you create and propagate the story of your company, let us know. Once you have a story catalyst (we call them Talk Triggers), you will prompt one or both of the two types of word of mouth. To demonstrate the difference between reactive word of mouth and proactive word of mouth, let’s use one of our favorite examples, the chocolate chip cookie at DoubleTree Hotels. Every day, for nearly 30 years, DoubleTree has given each guest a warm, chocolate chip cookie at check-in. Those cookies are LEGIT. And people tell stories about those cookies constantly. How often? Our research found that 34% of DoubleTree’s guest have told a story about the cookie. That means that given that they give out 75,000 cookies each day, the story is told approximately 22,500 times every 24 hours. That’s a LOT of word of mouth. And that’s why you don’t see much advertising from DoubleTree. The cookie is the ad, and the guests are the media. When your customer mentions your product or service when prompted, in the midst of an offline conversation, an online exchange, or similar. I am reacting to the situation and am making a recommendation in that context. “Referrals” is what reactive word of mouth is called in some instances. When your customer introduces or inserts your product or service into a topically unrelated offline conversation, online exchange, or similar. In this scenario, I am not waiting for the topic to come around to hotels before mentioning DoubleTree and their famous cookies. 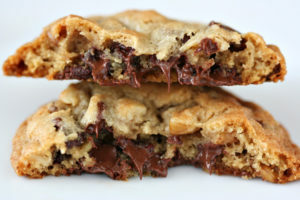 Instead, I am inserting the cookies into a broader conversation and turning the topic toward DoubleTree. Which Type of Word of Mouth is Best? Both are important. In fact, word of mouth is the most persuasive and most common way that people make buying decisions. However, proactive word of mouth is the superior type because it requires your customer to be so enthralled with your product or service that they are compelled to find a way to bring it up in conversation, even if it’s not on topic, per se. Telling a story when asked is one thing. Telling a story without being asked is something else entirely. It requires more conviction and more passion. To make sure the word of mouth about you is proactive as much as possible, you need to make certain that your Talk Trigger is truly differentiated. You have to do something different, that your customers do not expect, and then find irresistible. The book that Daniel Lemin and I wrote about this topic includes dozens of case studies that might inspire you to find your own differentiator that creates proactive word of mouth.